Challenge yourself on the most beautiful trek in the world. Set foot on this ancient Inca trail, the very trail used by the Incas. Witness spectacular landscapes and mountain views. Trek the most popular & historical path in the world.. Pass through diverse wilderness, amazing scenery & numerous Inca ruins on the magnificent.. Fly from Lima to Cuzco with time to acclimatize. Enjoy trekking the original Inca Trail to Machu Picchu. Experience hidden archaeological sites in the Andes. There's no better place to fuel up for an Inca Trail trek than Lima, home to a booming food scene full of delicious specialties like ceviche and chicharron. 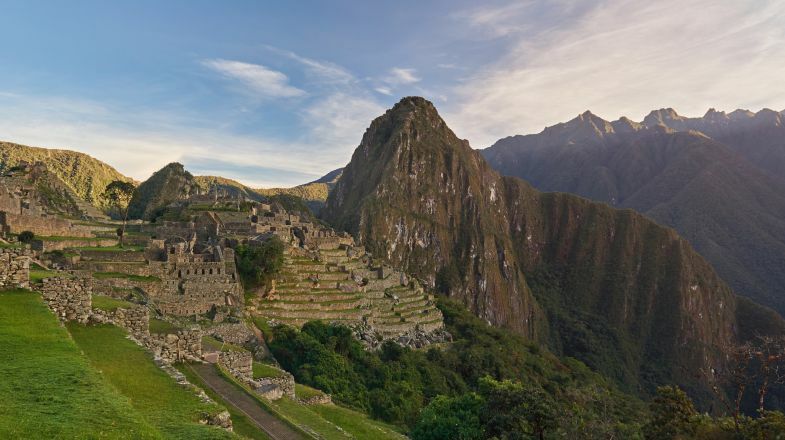 Marvel at the mother of all Inca cities – Machu Picchu – during a guided tour of the site. Take a guided stroll through Cusco, where Inca temples and Spanish cathedrals alike line the cobblestone streets. Hike the original & legendary Inca Trail. See hidden Inca ruins along the trek. Cross the Sun Gate in the early morning. Trek through amazing scenery with waterfalls and ruins. Enjoy stunning panoramic views of breathtaking valleys. Discover a unique Inca Sun Gate and amazing Machu Picchu. Descend into the vast catacombs beneath Lima on an underground tour. Marvel at ancient Incan architecture throughout the fertile Sacred Valley, before discovering the mother of all Incan cities, Machu Picchu. Experience a unique Inca Sun Gate and Machu Picchu. Staying at the comfortable Eco Quechua lodge featuring authentic Peruvian hospitality. This is the big one and one of the best treks in Peru! The Inca Trail winds its way along ancient Andean paths and goes past mysterious Inca ruins high in the mountains before finally, reaching the enchanting monument of Machu Picchu itself, nestling on its lofty perch. It is deservedly one of the most famous treks in South America and is the highlight of almost any trip to Peru. Here is the information you need for a successful and memorable trek. The Inca Trail involves four days of hiking along an ancient path high in the mountains and passes several sets of Inca ruins along the way. The most challenging section is crossing the infamous Dead Woman’s Pass at 4,200 metres (on the second day), after which the trek becomes somewhat easier and more enjoyable. After descending through mystical cloud forests and taking in more Inca ruins, trekkers finally arrive at Machu Picchu on the fourth day. Trek Difficulty: The Inca Trail is a challenging hike that usually involves four days of walking through tough, mountainous terrain. Much of the trek is above 3,000 m and reaches a maximum of 4,200 m.
Trek Duration: 4 days are standard. 5 days or 2 days variations are available. Remoteness: Very remote with no road access and few settlements. Maximum Altitude: 4,212 m at the Huarmihuañusca Pass (Dead Woman's Pass). Accommodation Type: Tents at campsites along the way. On the two-day trek, you sleep in a hotel in Aguas Calientes. Best Season: Dry season (April to October) when the paths are dry. The wet season (November to March) will leave the trail muddy and wet, increasing the risk of slipping. There is no ‘winter’ and the trek can be attempted year-round except in February when the trail is closed for maintenance. Start / End Locations: Cusco. Transportation usually includes a combination of minibus and train. Permits Required: Yes. To preserve the trail, permits are limited to 500 per day including porters and guides. In practice, this means that only 200 tourists are allowed on the trail each day. Permits are released in January for the whole year and sell out quickly, especially for peak season – it is imperative to reserve well in advance. Permits can only be obtained from government-approved tour operators and all visitors must be accompanied by a guide. Each permit is registered to one passport and is non-transferrable. Trekkers must carry their original passport and permit with them. There are checkpoints along the Inca trail where documents are inspected. Admission to Machu Picchu must be reserved in advance as well. Drive from Cusco to kilometre 82 (2,600 m) for the start of the trek. A gentle ascent of 400 m to the Inca ruins at Llactapata is followed by a descent to Huayllabamba and the first camp. A steep ascent to the highest point of the trek, Abra Huarmihuañusca (Dead Woman’s Pass at 4,212 m), is followed by a descent to the second camp at Paq’aymayo (3,600 m). This is the hardest day. This is the most pleasant day and it starts with a climb past the ruined Runkuracay staging post up to the second pass, followed by a descent to the ruins of Sayaqmarka, meaning ‘town in a steep place’. Another ascent leads to the third pass, Abra de Phuyupatamarka (3,650 m), and through bewitching cloud forest scenery, before descending to the camp at Wiñay Wayna for the third camp on the Inca trail. A final hike to Intipunku, the ‘Sun Gate’, and the first views of Machu Picchu from above. Trekkers descend to Machu Picchu for a grand Machu Picchu tour before returning to Cusco by train and bus. The shorter version of the hike starts at kilometre 104. 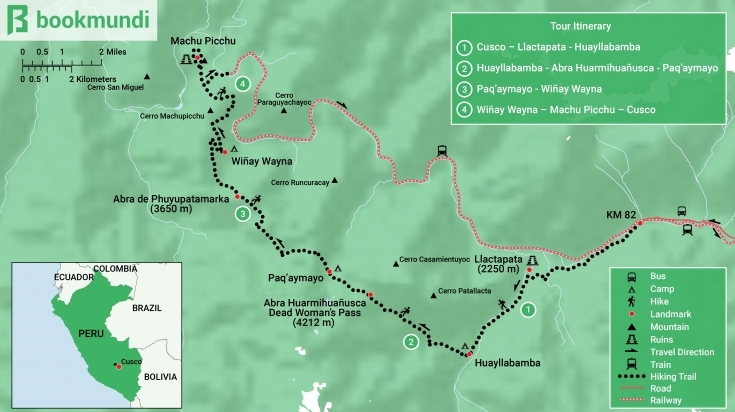 From here, trekkers hike to the archaeological site of Chachabamba (2,250 m) and then on to Wiñay Wayna. Next, they continue to Intipunku for sunset views of Machu Picchu before heading to Agua Calientes by car where they spend the night in a hotel. The second day involves a tour of Machu Picchu and transport back to Cusco. A more leisurely five-day version gives hikers the chance to avoid the crowds and stay at quieter campsites. It also allows more time to acclimatise and daily distances covered are shorter. Typically, trekkers travel to kilometre 82 and then walk to Llactapata on day one. The second night’s camp is at Llulluchapampa and Abra Huarmihuañusca is tackled on day three. The third camp is at Phuyupatamarka and on day four, the trek reaches Intipunku. The camp is near Machu Picchu at Puente Ruinas. Day five includes a tour of Machu Picchu and then transport back to Cusco. Alternative treks are available for those who don’t manage to book a place on the Inca Trail, or for those wishing to avoid the crowds. A popular choice is the tough five-day Salkantay Trek which crosses the Salkantay Pass at 4,600 m and later affords majestic views of Machu Picchu from above. Another option is the challenging Choquequiro Trek taking from 4 days to 9 days, where the 9 days itinerary crosses the Yanama Pass at 4,668 m as well. Especially the 9 days Choquequiro trek requires a high level of fitness. A third option is the Lares Trek, shorter and easier than the Inca Trail and requiring no permits. This trail see fewer trekkers compared with the Inca Trail. Altitude sickness can be a problem at altitudes of above 2,000 - 2,500 m and it is recommended to spend a few days in Cusco to acclimatise before attempting the trek. Early symptoms include nausea, vomiting, fatigue, headache and dizziness. Anyone displaying these symptoms should immediately descend to a lower altitude. You don’t need to be super-fit to complete the Inca Trail but a good level of physical fitness is required. Up in the mountains, if you struggle to keep up with the group, you will spend the whole time suffering and you won’t enjoy the trek. You can prepare for the trek by eating healthily and, if possible, attempting some easier hikes. It may be commercialised, regulated and crowded but the Inca Trail is still the quintessential Machu Picchu trek. Few can forget their first glimpse of those spectacular ruins from the Sun Gate high above, and the feeling of having conquered this classic Andean trek is something that will stay with you forever. Machu Picchu has seasonal weather, please do check up on the best time to visit Machu Picchu before planning your next trip to Peru. Since there is a limited number of permits per day, the Inca Trail is fully-booked practically every day of the year so there is no best time to beat the crowds. The Trail is closed every February for cleaning.